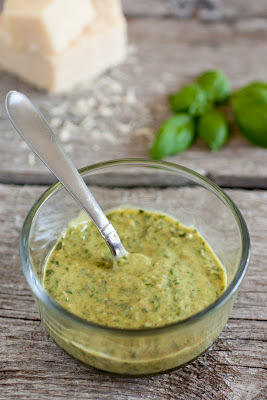 Is there anything like the delicious taste and incredible scent of fresh, homemade pesto? 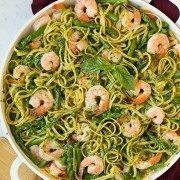 If you’ve got basil in the garden at its prime then I think you’re going to want to try this recipe. This definitely isn’t your ordinary pesto. The typical pesto uses all extra virgin olive oil (rather than half olive oil half butter), pine nuts, no lemon juice and one type of cheese, which is usually Parmesan. I wanted to change things up and make new and exciting pesto, so I chose to add none other than one of my favorite ingredients, browned butter. Then I wanted to switch out the typical nut and use my favorite nut which is almonds. I also decided rather than using whole almonds to use almond butter because of it’s smooth texture and light sweetness. Then for a very slight fresh tang I added a little squeeze of lemon juice. 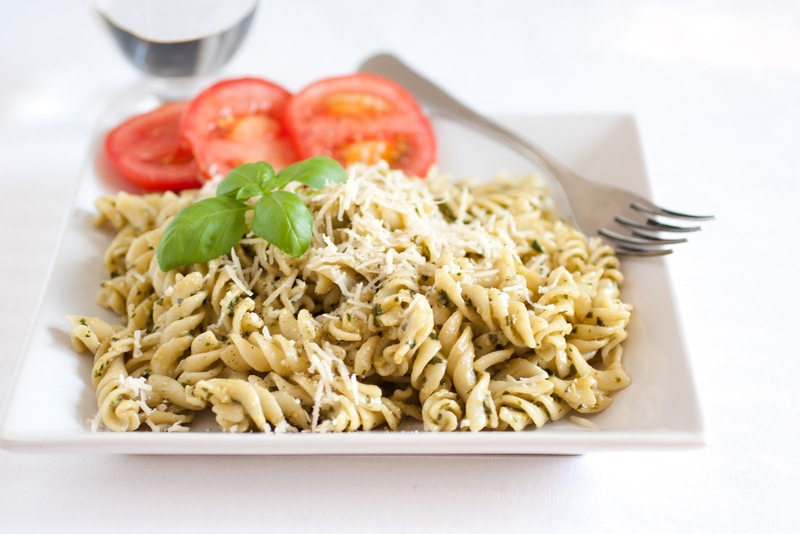 Spread this pesto over some freshly boiled pasta along with a light sprinkling of cheese and you’ll create a meal worth remembering. So simple yet so divine. It’s amazing what fresh basil and browned butter can do especially when combine together. Enjoy! A deliciously buttery easy to make pesto. Add basil to a food processor and pulse a few times. Add garlic, Romano cheese, Parmesan cheese and almond butter, then with motor running, stream in butter and olive oil and pulse until well blended. Pulse in lemon juice and enough warm water to reach desired consistency. Season with salt and pepper to taste. Serve over your favorite pasta. Store in an airtight container in refrigerator up to 3 days. 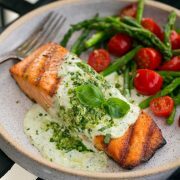 *I used Maranatha brand, it has a little bit of added cane sugar in it which I thought complimented the natural sweetness of the basil, but you can use unsweetened almond butter instead. 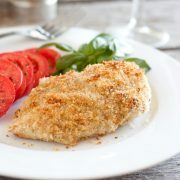 Alternately you could use whole roasted almonds, about 1/4 cup, just pulse them in the food processor several times before adding in the basil and other ingredients. **After browning the butter, I poured it into a bowl and set the bowl over an ice bath and swirled the bowl and it cooled much quicker then just letting it rest at room temperature.